1) Water withdrawals – drilling and hydraulic fracturing (fracking) require large quantities of water. 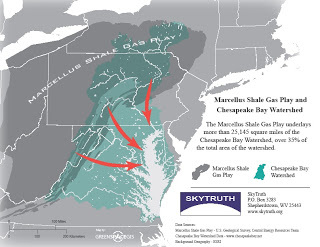 The high-volume slickwater fracking performed on Marcellus Shale gas wells can use up to 3 million gallons of water per frack. It’s not unusual for a single well to be fracked several times; and for a single drilling location to host several wells reaching out in all directions. Water can be brought in by tanker truckor pipeline. The closer the water source, the cheaper it is for the operator, so often they request permission from state and local authorities to take water directly from nearby streams. As an example, XTO Energy (a division of Exxon) is seeking permission to withdraw up to 250,000 gallons per day from Oquaga Creek in upstate New York, a small trout stream annually stocked by the state. My father-in-law and his fly-fishing buddies know this stream personally and think this withdrawal would destroy it as a trout stream. Pennsylvania has already issued many water withdrawal permits for drilling and other activity (map). 2) Water disposal – the fluids used for drilling and fracking contain a wide variety of potential contaminants. Produced water — water originally held in the target geologic formation that is produced along with the gas — can contain elevated levels of dissolved salts and, in some cases, low level radioactivity. Spills of these fluids, and leaks in the plastic liners in fluid-reserve pits on the drillsite, can contaminate surface streams and near-surface groundwater. Standard municipal wastewater treatment facilities are not equipped to remove some of the contaminants in these fluids, so specialized treatment facilities must be built to process this wastewater before it can be released to streams and rivers. 3) Groundwater contamination – when it comes to drilling safety, the devil is in the most mundane of details. Cement, for example. Cement pumped into the bottom of the well, and sealing off the fracked intervals, is the main line of defense to prevent gas and fluids from moving where you don’t want them to go. Poor cementing was the proximal cause of the disastrous Montara blowout and spill off Australia in 2009, and the fatal BP / Deepwater Horizon blowout and spill in the Gulf of Mexico last year. A recent Wall Street Journal investigation revealed that problems with cementing are alarmingly common. Casing failures, corrosion, poor drilling practices and other factors can also allow unwanted fluid migration. The end result: a growing roster of cases where drilling activity is related to the contamination of drinking water supplies across the nation. By the way, thanks to careless use of drilling terminology by some environmentalists and politicians, a big semantic argument has broken out, focused on whether the hydraulic fracturing procedure itself is the cause of contamination. More on this topic later, but we think this argument misses the mark: fracking is the repeated pumping of fluid into the well at extremely high pressures designed to break open rock, so any weakness or flaw in the well design or construction (like a poor cement job, for example, or cheap imported steel casing) is much more likely to lead to failure in a fracked well, than it would in one of Dad’s old-fashioned unfracked wells. By The Way, Part Deux: National energy legislation in 2005 exempted the drilling industry from disclosing the chemicals they use in fracking, making it difficult for homeowners to monitor the quality of their drinking water without spending a fortune on water analysis. ShaleTest is a new outfit that is trying to help homeowners with this. 4) Stormwater runoff contamination of surface waters – this is the unglamorous way that streams, ponds, wetlands and rivers could be impacted by drilling activity. A drill site, after all, is essentially a concentrated construction zone several acres in size: trees and brush are cleared, the land is graded flat, gravel is trucked in and spread out to create a space for all the trucks, equipment, supplies and people needed to drill, frack and complete a well. Access roads are built; pipelines and other utilities are installed. All of these elements of drilling infrastructure are potential sources of muddy runoff when it rains, changing the physical and chemical properties of streams with impacts on the aquatic life and downstream water users. The construction industry in general is subject to Clean Water Act rules to control stormwater runoff, but – yes, you guessed it – the drilling industry is exempt from those rules. Ben’s work is focused on investigating if this potential for runoff really is a measurable problem. 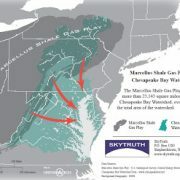 If so, it could complicate the decades-long, multimillion dollar effort to restore water quality in the Chesapeake Bay. This excellent map, created by SkyTruth volunteer Dorn Moore of Greenspace GIS, shows that over one-third of the Bay’s watershed overlaps with the Marcellus Shale gas play.Assuming one drilling location per square mile, that could mean as many as 25,000 drilling sites will be built in the Bay watershed (even more as other geologic formations, like the Utica and Ithaca Shales, are targeted for drilling). If these sites cause measurable degradation of water quality, that could be very bad news for the Bay.